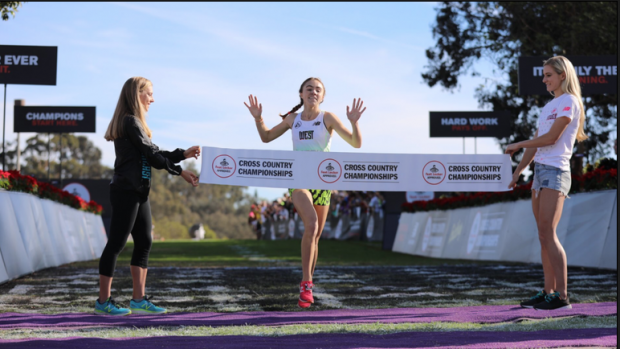 Claudia Lane of Malibu High School in California successfully defended her Foot Locker Nationals title on Saturday morning at Balboa Park in 17:03.4, one second faster than her winning time in 2016. The junior had Melody Fairchild's 16:39.2 course record on the brain, a mark that has stood since 1990. But she reportedly had a sore throat on race day, according to the in-stadium announcers, and couldn't quite tackle the pace by herself as she ran anywhere from 15 to 20 seconds ahead of the field for the entire race. She'll have another shot at the record next year as a senior, when she will have the opportunity to become the first-ever three-time Foot Locker champion. "I'm so excited, so grateful to have this opportunity again," Lane said after the race to Carrie Tollefson. "[The record] was on my mind but I'm fine that I didn't break it, especially with next year. The uphills were a little tough but overall was a fun race." Lane jetted out in 5:17 for the opening mile, with the rest of the field passing through over 5:30. By two miles, she had slowed slightly to 10:57, while Michigan's Olivia Theis and Illinois' Katelynne Hart had emerged as the leaders of the chase pack with an 11:12 split. By comparison, Lane's splits last year were 5:18 and 10:55. Even without the record, the run caps an impressive year for Lane that saw her break several course records set by legendary California prep phenom Sarah Baxter, including an unreal 15:49 over 2.93 miles at the Mt. SAC XC Invitational, 16:30 over 5K at Woodward Park for the CIF State Finals and 16:59.6 at the Mt. SAC 5K course for Foot Locker West. Ultimately, debate will continue about who is the true top girls high school cross country runner of 2017 as Nike Cross Nationals champion Katelyn Tuohy of New York was just as dominant on the East Coast this year, with new records at Van Cortlandt Park's 2.5 mile Manhattan Invite course in 13:21.8, Bowdoin Park in 16:52 and Glendoveer Golf Course for NXN in 16:44. Sophomore Hart, fourth at NXN last weekend, outkicked Theis --a University of Michigan recruit-- for runner-up honors, 17:22.5 to 17:22.6.